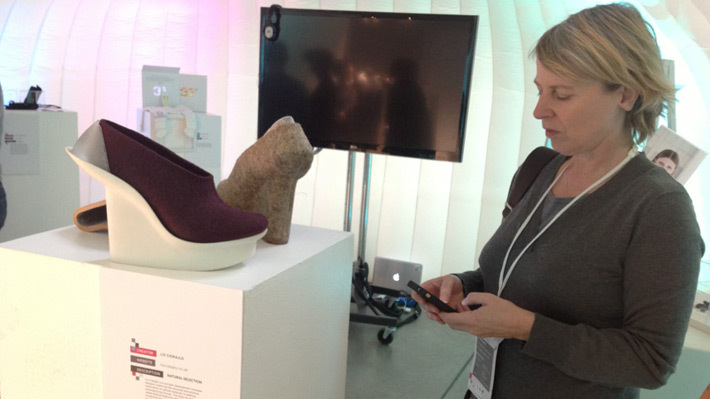 Carey Jewitt taking digital fieldnotes at Wearable Futures 2013 in Ravensbourne. Apt for the time and pace required to develop interdisciplinary ways of working, notably the need to ensure interpretative validity and sensitivity across disciplinary contexts. MIDAS combines ethnography with multimodality to capture the visual and multimodal context of the arts and social science, notably with respect to embodiment and technology (Jewitt, 2013). Combining these perspectives enables investigation of the diversity of resources that people use in their everyday worlds and how communication is realized through diverse modes as part of complex social practice through a focus on material objects, spatial features, and visual phenomena. As Dicks and colleagues (2011) have shown, this multimodal ethnographic approach expands the realm of what counts as data, helps to create meaningful analytical dialogues between different data forms, and different insights are gained by combining different forms of data/media. It also raises questions for how to produce fieldnotes – which Professor Paul Atkinson, in his NCRM Annual Lecture on Why do fieldwork?, described fieldnotes as one of the most important ethnographic tools for successful data analysis. In this blog post we discuss the challenges MIDAS raises for making fieldnotes, and show how we structure and produce our fieldnotes. In MIDAS our focus on methods, the digital, and embodiment in the digital arts and social sciences means that what we are observing and experiencing is highly multimodal – visual and embodied – and it is not possible to capture this by writing and sketching alone. Like many, notably Bella Dicks, Sarah Pink, and differently so Christine Hine, we have turned to digital fieldnotes. As Christine Hine notes however, ‘The key challenge here is in understanding how to do multi-modal studies. This is especially challenging since the ethnographer’s toolkit changes with every new setting. We don’t know what that toolkit consists of because every time we do a new study, we have to choose what combination of sites, methods, writing practices and techniques we need to use’. In MIDAS we combine written fieldnotes, with photographs, audio recordings and video recordings to capture the rich complex interactions in each site. This involves undertaking direct observation of a range of practices – influenced by a digital ethnography perspective we use digital portable technologies such as tablets or mobile devices to collect all these ‘notes’ on one device. MIDAS is a collaborative research project, and so one requirement of the fieldnotes is that the research team members produce consistent fieldnotes that can be indexed and searched by the team- a standard format is used to enable this. We have been iterating and refining a fieldnote template, whose latest version is downloadable at the MIDAS website for your use and adaptation. 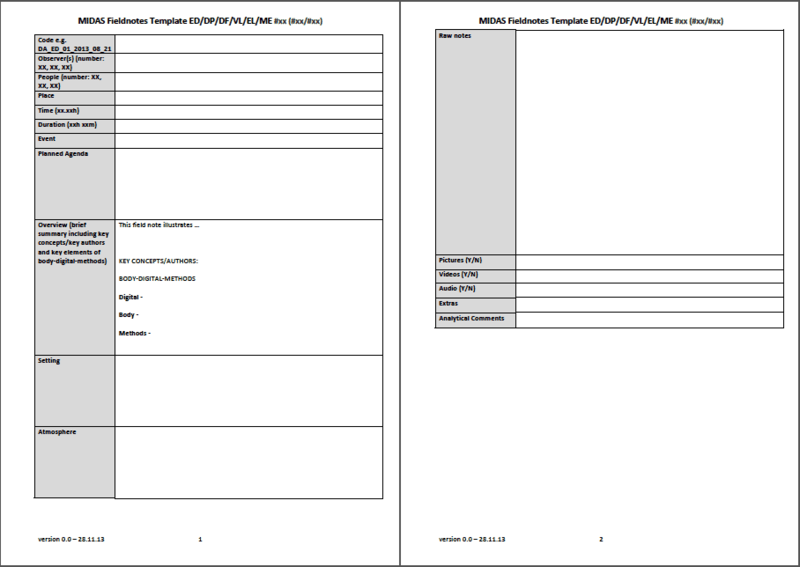 Screenshot of the MIDAS fieldonotes template. Our working process includes a first stage of writing fieldnotes in situ, and a second stage of completing the fieldnotes using the MIDAS template. A coding system is used to identify the site, date and anonymised participants. The template includes descriptive account of the event – who was involved in the event, place/time/duration of the event, and a brief description of the type of event, agendas or distinct parts of the event, as well as key concepts/key authors mentioned or used in the event, and key elements of body-digital-methods brought into play. The ‘notes’ – including photographs, short videos, sketches and scanned texts, are collected to provide a range of contextual data such as a description of the setting and the atmosphere. This overview is accompanied by full raw ‘notes’ – again combining a range of media – to provide a detailed account of the event that can, as Lofland suggests ‘allow the world to speak back to us’. The fieldnotes includes a list of related external files including photographs, videos, audio files and extra files such as links to participant/site websites or documents such as PowerPoints used during an event (these are linked to or embedded within the fieldnote via a coding system and a brief description). Others, such as Tricia Wang have taken a more radical approach to digital fieldnotes, combining fieldnoting on Instagram to produce ‘Live fieldnoting’. This draws on but differs to ‘lifeblogging’, and is ‘a blog post that is intended to provide an on-location and synchronous visual and textual coverage of an instance from the ethnographer’s fieldwork. The live fieldnote is created with an image sharing app on a mobile phone that is then shared to other social networking services. Images are accompanied by a description of the image and can also include a brief analysis of what the interaction means to the participants in the image and/or to the ethnographer. All live fieldnotes are timestamped, publicly accessible on the internet, and include location data. Brown, B. (2013) Ethnographic approaches. In Price, S., Jewitt, C. and Brown, B. (eds.) Sage Handbook Digital Technology Research. Sage: London. Dicks, B., Flewitt, R., Lancaster, L. & Pahl, K. (2011) Multimodality and ethnography: working at the intersection. Qualitative Research, 11(3) p.227-238. Emerson, R., Fretz, R., Shaw, L. (2011) Writing Ethnographic Fieldnotes. Second edition. University Of Chicago Press: Chicago. Hammersley, M., Atkinson, P. (1995) Ethnography: Principles in Practice. Routledge: London. Lofland, J., Snow, D., Anderson, L., and Lofland, L.H. (2006) Analyzing Social Settings: A Guide to Qualitative Observation and Analysis. Fourth edition. Wadsworth/Thomson Learning: Belmont, CA. Schneider, A., Wright, C. (2010) Between Art and Anthropology. Bloomsbury Academic: London. Van Maanen, J. (2011) Tales of the Field on Writing Ethnography. Second edition. University Of Chicago Press: Chicago.